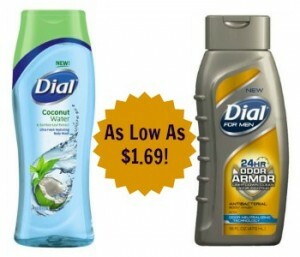 Home > Printable Coupons > Dial Soap Coupon | Body Wash As Low As $1.69! Dial Soap Coupon | Body Wash As Low As $1.69! Here is a new Dial soap coupon that is sure to make for some great deals! Pair it with the buy one get one sale at Walgreens this month and pick up body wash for just $1.75 each, regularly $5.49! Or get Men’s body wash for just $1.69 after stacked coupons at Target.